There is this business with the dentist. I have decided it is time I did something about it. Remember when I couldn't stand the idea of going and I postponed it? That is how desperate I get. It is just that every time I go I get hurt and yelled at. 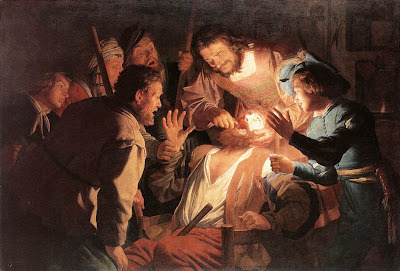 My visits are beginning to remind me of the 1622 painting "The Dentist," pictured above, which is fine when it is at the art gallery in Dresden but not when it is my life, you know? My dentist is great but I never see him any more. I have not seen him for years. All I see are his hygienists. And they are all alike. They are these skinny, pretty, severe women. It is cliche to think of them as being like Nazis but that is what they remind me of, I am sorry. Yesterday I was stuck with someone named Chrissie. Now, you know me, I am always Water-Pik-ing my teeth and I take my time with it and I go over and over my teeth and I do everything I can. But it was not enough for Chrissie just as it was not enough for whatever little Nazi I had last time I was at the dentist. Chrissie was digging and scraping and removing stuff from my mouth that had gotten lodged in there apparently. "You have to floss better," she was telling me. "I am flossing as much as I possibly can," I said. Not to get into big bad detail, but she had this bib on me and she was using the bib to set up a kind of display of all the stuff that had been stuck in my teeth. And she began getting all sharp with me. "Just let me show this to you," she said. "That's great, I just don't know what else to do about it," I said. "Well, I am just telling you--"
"Well, I am just telling you there is nothing more I can do." That was me getting mad. Later I got conciliatory because I always do that and besides, I realized I had to be nice or I would never get out of there. But honest, the whole time I was in that chair, I started thinking, I should get up. I should leave. I just do not like being talked to like this. They are not supposed to talk to you like this at the dentist anymore! This is a new day and age. We hear all the time that you are no longer supposed to be afraid of going to the dentist. Leonard Pennario even used to go to lunch with his dentist. It was in his diaries. His dentist's nickname was Smiley. Why can't I have a dentist called Smiley? My dentist situation is terrible! ... my friend Jean Schneggenburger and I were obsessed with dentists and dentistry. Her dentist actually had initials that were DDS. We used to ponder that, sitting on the logs by the side of the school yard. Back to Chrissie and yesterday. The indignities visited upon me during my cleaning were bad enough. That is a phrase I love, "visited upon." But things got worse after that. Chrissie took an X-ray of my mouth. This always happens! 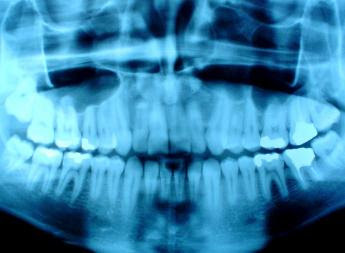 I am sure there are more X-rays of my mouth than of anyone else's mouth in the whole world. Millions exist! There are even some kicking around my house. That is how many there are. Then she pronounced the news bad and I am supposed to go back next week and get numbed out and she is going to root deep into the area under one tooth and do something or other. She will do this herself and insurance might not cover it and it will cost $188. "Just so you know," she said. Later I started thinking about this. Since when do hygienists do this kind of stuff? If I am going to get a root canal, or whatever this is, I do not want a hygienist doing it. Perhaps my dentist has been taken captive and is strapped into a chair in the back somewhere. As I said I have not seen him for years. So I switched to Howard's dentist. Howard's dentist is nice and he will be there supervising his hygienists and he will not yell at me. I have met this dentist before. He turned up at Little Portion Friary as a volunteer once when I was cooking. We yakked with each other for about two hours about your normal soup kitchen stuff -- cooking and our parishes and priests we both knew -- before we put it together that my husband was his patient. So I am going to go to New Dentist. It is like New Boyfriend used to be when I was single. All my friends and I would joke about New Boyfriend and New Girlfriend when we were discussing our lives and the lives of people we knew. I have to call up Old Dentist and get my X-rays, all 1,000 of them, sent to New Dentist. That is one thing I am not looking forward to. Thanks, stupid privacy laws! But I am looking forward to New Dentist. I will report how it goes! Yet we go to specialists for doctors all the time without an issue. This may be part of the reason why women buy their hairdressers holiday gifts -- they don't want to search for a new one, and a gift might keep them around. It sounds like you made a good move by changing dentists. Good luck with the new one. My hygienist once said to me "People like you who do not floss regularly are good candidates for a full set of dentures". That phrase revererates in my mind as I settle into bed and remember that I have neglected to floss before turning in. Come on, you shouldn't be that scared of going to the dentist. It not an easy thing to do but it is necessary.